Kid's Party Melbourne, Kids reptile parties ®, Melbourne kids party. 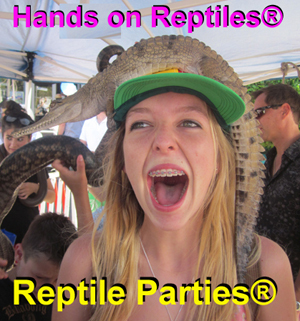 Why are genuine reptile parties® better than the imitators? ... Melbourne's only "hands on" reptile show at kids parties. ... Hold the animals rather than just getting close! ... Our staff are Melbourne's recognized wildlife experts. ... More reptiles than at any imitator's parties. ... Unmatched standards of safety and education. ... A birthday party gift no one in Melbourne can match! ... We are the most fun party for kids! or, (see the FAQ link for all reptile displays). But the main thing that people notice is that at a genuine Reptile Party® you get Australia's only hands on reptiles® party in that people can actually hold the animals rather than just seeing a "show and tell" display as done by those who copy us. Imitators only allow people to touch, but not handle the animals. We invented educational reptile parties and that's why we own the registered trademarks! Beware of poor quality imitators, their slick websites and questionable claims of experience. 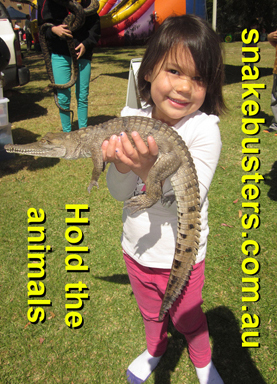 We bring heaps more critters at a time to our childrens parties and kids can hang onto their reptiles, because we bring enough for everyone to hold at the same time! We bring dozens of critters rather than just a few! No other kids wildlife party or snake show comes close! Tiny snakes, monster pythons, lizards, crocodiles, tortoises, frogs, a birthday gift that isn't junk, etc ... we bring the lot to our reptile show! Snakebusters give you the extra's without you paying extra! We are alone in Melbourne in not quoting surcharges for Crocodiles, no more dollars to bring the deadly snakes, not charging a fee for extra kids above some miniscule number (no limit on kids at our party! ), no last minute GST grab and free kids party invitations (see links here). 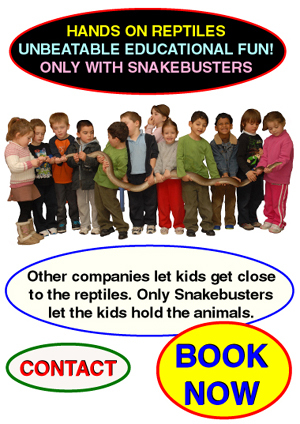 ... Don't take risks - demand Snakebusters, alone with a perfect safety record exceeding 30 years! It's best to phone us (day or evenings are OK), rather than send an e-mail. We don't get all e-mails sent and don't necessarily respond to them straight away. More importantly, as Australia's best reptiles®, we're always heavily booked, so it is best to book your Snakebusters mobile reptile show before sending out your invitations and the like. (or questions worth asking if shopping around for kids reptile birthday or reptile display in Melbourne). Click here to download Reptile Party® birthday party invitations. 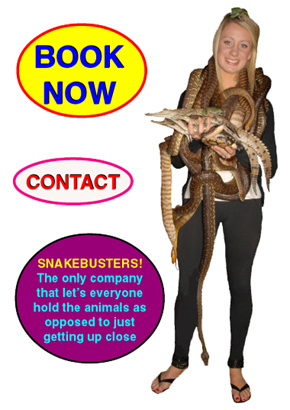 Return to the Snakebusters website entry for school incursions for children's events, shopping malls, adults parties, corporate training and events, consulting, snake catching, scientific research and publications, film, TV, etc. 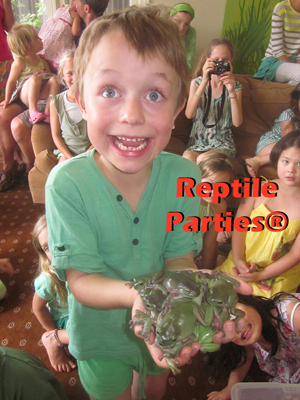 Reptile parties® and Reptile party® includes registered trademarks for the following activities: Kid's party, kids party with snakes, kids party with crocodiles, kids party with lizards in Melbourne, Victoria, Australia. 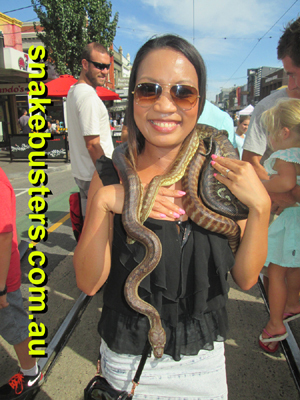 Snakebusters are Independently rated Australia's best reptiles including for a kids party with reptiles. Only at our parties is the education hands on, where people can hold the animals at a mobile reptile party, with the most audience interaction. This gives the best educational outcomes for incursions and with the best reptiles displayed. © 2004-2016, Snakebusters. All rights reserved. Snakebusters® Reptile Party® Reptile Parties® Snake Man® and Snakeman® include several registered trademarks in several categories and jurisdictions, including specifically for kids parties with reptiles, events, school incursions, reptile demonstrations, venomous snake awareness and safety displays, courses and the like in Melbourne, Victoria, Australia and elsewhere including the USA and UK. Unauthorised use, misuse, dilution or other activities relating to the trademarks is prohibited, including in Melbourne, Victoria, Australia or anywhere else where we exercise trademark rights and intellectual property rights. 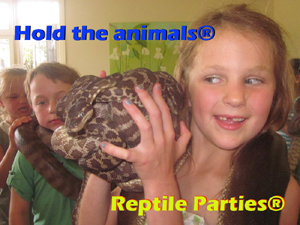 kids party shows, birthday parties Melbourne, and reptile party Melbourne.